Metallic coatings for Galvanized Chain Link Fence Fabrics (cold electro galvanized or hot dipped galvanized) are standard. Galvanized steel chain link fence are made with wires pregalvanized. The wires are galvanized and the minimum zinc weight for horizontal wires is 275 g/m2 and for the vertical wires is 290 g/m2. With zinc protective layer, the gal. steel fence offers a good acid and alkaline resistance and is suitable for outdoor fencing uses against weather and sunshine. We offer fence fabrics and matching posts to complete the fencing system. The fence posts are also made of carbon steel treated with galvanizing coating layer. Posts types include peach post, square post, Holland posts. Galvanized chain link can also be used as decorative mesh in modern buildings. Why Galvanized Steel Chain Link Fence a universal fencing? Galvanized steel chain link fence is supplied in mesh rolls. Yudemei supplies various chain link wire mesh for customers, mainly galvanized chain link fence (two types: electro galvanized and hot dipped zinc plated fence), stainless steel chain link fence and PVC coated iron chain link fence. Galvanized chain link fence is the most popular and economic cost type. Other types of chain link costs higher due to more processing steps involved ( for example, the plastic coated chain link fence needs additional plastic coating besides galvanizing) and materials cost ( for example, stainless steel costs much higher compared with mild steel wire applied for the galvanized steel chain link mesh). So, if you emphasize on colors, plastic coated chain link fence is your best choice for it can be painted freely to many colors. Galvanized fence is chosen for its zinc protective property, economic cost and bright shine surface. Steel wire mesh fencing provides an aesthetically pleasing yet strong barrier. Each fence panel is produced by an automatic hooking woven process. The simple, clean lines are particularly suitable for both prestige and security applications including residential, sports, leisure and industrial uses. Woven diamond pattern provides strong, durable and flexible construction. Material: First-class galvanized iron wire. Traditional chain-Link fencing is the ideal choice for a smart, secure, boundary fences for industry. With economic cost, galvanized steel mesh chain link fence panels are mainly used as fences for playground and gardens, super highway, railway, airport, port, tennis court, etc. Chain link fence is also used in breeding of animals. 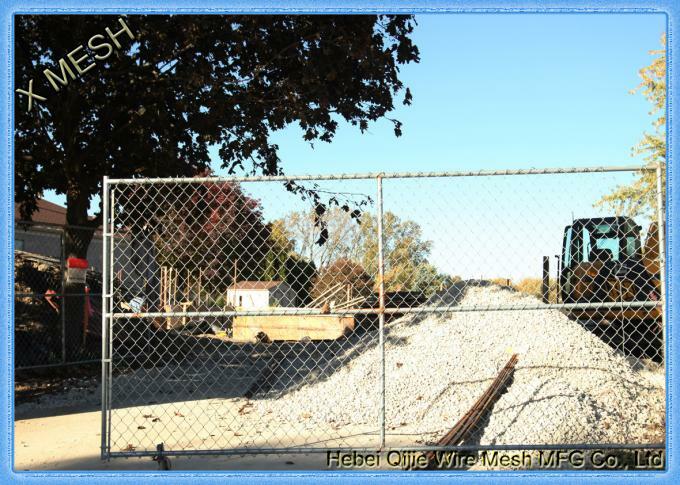 We offer the following chain link fence for industrial uses as typical sizes. For other sizes, you are welcome to send your specific requirements including the opening, the wire diameter, the length and width of the fabrics. Roll size: 1mx30m or custom sizes. Different fabric length and width can be supplied upon the customers' request.